When I say I cannot imagine it, that’s a lie. I know exactly how it feels. I know that it feels like a bottle of fizzy drink. I know that it feels like you are the only person having to deal with the incredibly draining thoughts. I spent 9 months training to find someone, something or anything to make me realise that I was not the only person going through this. But there was nothing. And that’s when I found it. Courage. Sitting on my bed in the hospital, I turned to my parents and said that I was going to tell everybody that I was suffering with Anorexia Nervosa and that I was currently hospitalised because of my condition. I felt like I had nothing to loose, I wasn’t ashamed and I figured I would rather get in there first before rumours were spread about my disappearance. There it was- the best post I have ever made on Facebook and the start of a brand new journey. I decided right then that I never wanted anybody to feel the same way that I did and I was going to be open and honest about my mental health difficulties. I signed the Time to Talk pledge, spoke on the radio numerous times, wrote newspaper articles, started a blog and made speaking about mental health become a part of my life. People approached me in person, over Facebook or through my blog to ask questions, talk about their own experiences and thank me for sharing mine. I heard stories of people not understanding what they were experiencing, feeling alone and not knowing what to do. Can you imagine your brother, parent or best friend feeling like that? You can start that conversation. Text a friend you haven’t heard from in a while and ask them how they are, or make a hot drink for someone and make time to have a conversation. Whichever way you approach it, just remember that the most important thing that you can do is listen. It can sometimes be hard to know what to say, and even as someone that has been through a diagnosis myself, I still worry about what I say to other people that I have conversations with. However, I have found the advice and tips on Student Minds ‘Look After Your Mate’ page and on the Time to Talk website to be extremely helpful. From thinking about where is the right place to start a conversation to considering how you phrase your responses; there are so many useful resources available to help you make that important step for someone you care about. 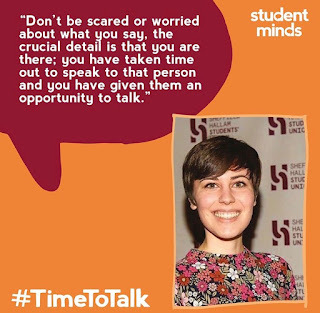 But don’t be scared or worried about what you say, the crucial detail is that you are there; you have taken time out to speak to that person and you have given them an opportunity to talk.